A few more jobs reports like February’s might put a dent in the nation’s still-high unemployment rate. The Bureau of Labor Statistics said U.S. employment surged by 236,000 last month, nudging the jobless rate down to 7.7 percent. But a summary of unemployment rates for various age groups, recently published online by the Urban Institute, showed variations in the rate, by age. Rates have been consistently lower over the past decade for older workers than for those in their 20s, 30s, and 40s – even during and after the Great Recession. In a still-sluggish economy, one might wonder: are older workers who remain on the job somehow depriving younger adults of work? There is “absolutely no evidence of such ‘crowding out’, ” concluded the Center for Retirement Research, which supports this blog, in a recent study analyzing the labor market from 1977 through 2011. To rigorously test this relationship, the researchers tried several statistical variations – even looking at the older-younger worker dynamic during the Great Recession. They kept getting the same result: no crowding out. If older workers are working longer it is based on two things. Fear and interest rates. Fear because the value of their house is still depressed by 30+% and their 401(k) is still partially tanked or they might have moved their funds to safer equities and missed the recovery. But most of all, it is because interest rates are in the tank! I am retired for 27 months and I never expected that I would be receiving 1% return on my SAFE investments. This situation is killing seniors and senior spending has led the country out of many a recession. As seniors keep growing as a component of the population, the impact of extended low interest rates is not only devastating to the individual but to the economy in general. Joe is right that the very low interest rate is putting seniors in a difficult position: accept no more than a 1% yield in a “safe” investment, which, even with a low inflation rate, produces a loss of purchasing power, OR accept the risk of higher yielding investments. The latter is what the Fed’s low-interest rate policy has been intended to do, presumably to stimulate economic growth. So this situation, as well as losses of wealth in recent years, has likely motivated many men and women in their 60s to stay in or return to the labor force. But these factors can’t explain the fact that the increase in the labor rates of people of that age. The increase in their full-time employment began in the mid 1990s, when the stock market was booming and household wealth was rising. 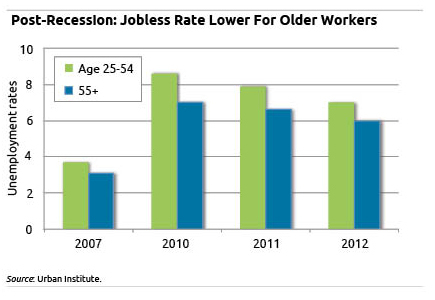 For a report describing this trend, see the Jan. 2008 issue of the Monthly Labor Review (available online at bls.gov).